The thirst for equality can express itself either as a desire to draw everyone down to one's level, or to raise oneself and everyone else up. 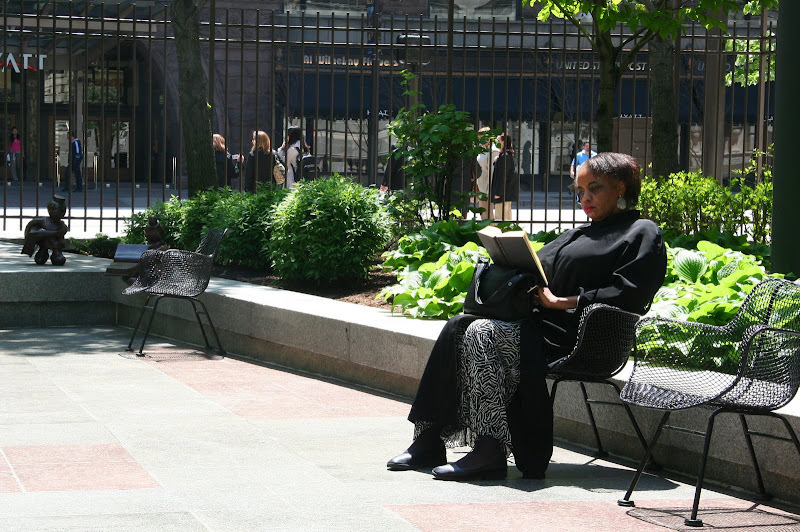 one of my favorite things is the eastman reading garden at the cleveland public library. last week I made a point to walk through the garden everyday - I never know what delight I might encounter! it is sad when the garden is locked up during the winter, I don't understand why; although it probably has to do with the cost of maintaining the garden during the winter. considering all the granite and marble in the garden, the garden it probably viewed as a lawsuit waiting to happen. winter in cleveland can be fierce. 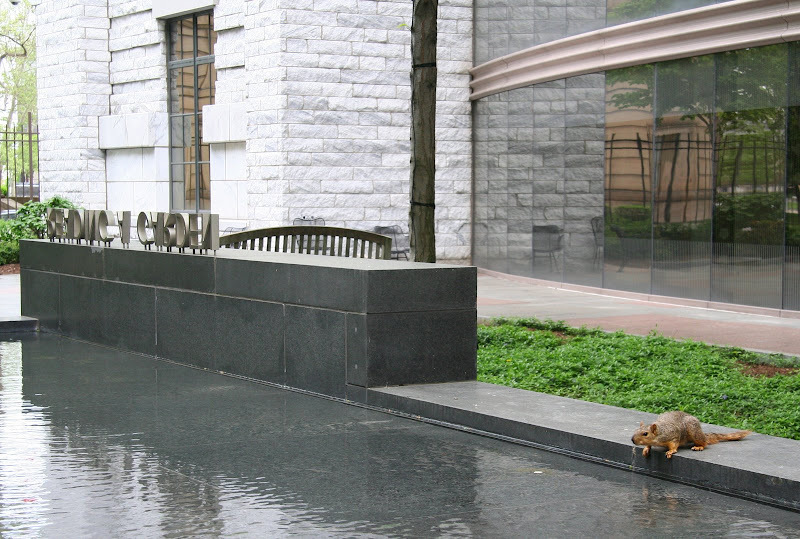 the centerpiece of the garden is a sleek, smooth reflecting pool made of black granite. it is designed by maya lin, the artist and architect best known for the vietnam veterans memorial (coincidentally, reya recently wrote about her visit there). what you probably don't know is maya lin was born in athens, ohio and that along with the vietnam memorial she designed another important monument - the civil rights memorial in montgomery, alabama. it has been years since I've been to alabama, and then my visit was confined to visiting family in the beautiful city of mobile. however, after reading about this memorial I believe that next time we make a road trip to texas, we need to take the long way! until then, I can satisfy my thirst to check out more of maya lin's work as there is an interesting installation, maya lin: systematic landscapes, currently at the corcoran gallery in washington, dc. great. I'll be down to d.c. at least once before the show leaves in mid july! for mouse readers not traveling to dc this spring or summer you can check out the exhibition here. the reading garden also is home to a whole village of those delightful tom otterness characters - you can see two of these guys in the bottom photo. john coltrane and friends playing my favorite things (1961 in baden-baden germany). coltrane was one of the most influential and talented jazz musicians and composers of our time. it is a tragedy that coltrane died so young - in 1967, at 40 of liver cancer. coltrane was amazingly prolific and left an incredible legacy of recordings and compositions. always a spiritual person, during his thirties coltrane started seriously exploring the world's religions and fusing what he learned into his music. I'm surprised no one has ever done a biopic of coltrane's life, at least not that I know of; however, I have heard that there are a couple decent standard documentaries. These little bits of Cleveland are like virtual travel. The "wild" horses; the reading garden. The jury room. Thanks for giving us a glimpse. Oy. Favorite things by Coltrane - and in the Baden-Baden recording, yet. Wunderbar! Love the squirrel photo! Cute! I just love how you share your City, wisdom, music, art, quotes! It is always a worthwhile stop! insightful post, kimy. the squirrel is just a deary...the john coltrane is yet another beautiful tribute as you so often do to various subjects...wowwowwow! I'm glad to hear that folks are enjoying these little glimpses of life in cleveland.... it is a wonderful place to be, who would have thunk! I can't believe that come july I'll have been here 12 years - it is true times flies when you are having fun! sparker - wouldn't that be divine if there were little islands of reading gardens everywhere! sounds like a project for the O man! Great video! The new live EP by the Derek Trucks Band has an excellent performance of MFT. Holy moly! Look at the size of that squirrel and I thought they were itsy bitsy things! Love photo walks around people's environment and your photos are just tremendous.